Here we are able to offer you the ability to have your silverware re-plated to restore it to near the condition it was when originally purchased. Send us your tired, old cutlery or silverware and we will have it repaired, replated and refurbished. Polishing is also available for Stainless Steel or Sterling Silver products. Why not get your family silver rejuvenated? Sterling silver items can become tarnished despite regular cleaning over the years and a new coat of silver would be just the job to bring it back to near-original condition. The process of replating was discovered in the 1840's. A nickel silver or copper item is coated with silver cyanide where the additional silver is applied electrolically (using a current). This deposits the silver onto the base metal and ensures a strong adhesion. The more silver that is applied, the longer it is expected to last before needing replating again. For more details, see the EPNS page. As a rough guide 10 microns is expected to last 20 years with reasonable care and use before requiring replating again, 20 microns 30 years and 30 microns 40 years. Prices above are for regular size cutlery/flatware items only. For Hostess, large items and non-cutlery pieces, please send a couple/set of digital photos with dimensions that we can show to the factory for assessment and quotation. Be sure to quote sizes and as much information as possible e.g. whether there is a mix of material, a wooden base, whether dismantling is necessary/possible, what is the base metal, is there any damage, etc, etc. Please send to: Sales@SteelCityCutlery.com or use the Image Upload Facility (don't forget to submit the form below first). Payment by Cheque, made payable to R P Day & Co.
Online Payment via Credit/Debit/AMEX Card using our secure server. Via Bank Transfer (Details will be provided after Quotation). 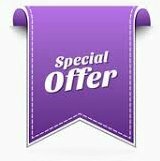 We are able to offer bulk discounts for multiple pieces depending on the quantity. Complete in the form below and include the total number of pieces and we will provide you with a quotation. WHICH ITEMS CAN BE REPLATED? We have today received our re-silvered tray, and I must say that we are absolutely delighted with it - and what good, quick service!! My wife has been a little 'low' for a day or two due to medical problems, but this really lifted her - she has polished our silver tea set which resides on the tray, and is really pleased with it - so thank you, and your staff for your work. The 2 silver trays arrived this morning at our office and both my wife and myself are delighted with the workmanship and in restoring both to their former glory. The trays were a gift to us from an old friend which we have now passed to my daughter and her husband to look after. Hopefully they will refrain from the Brasso!! 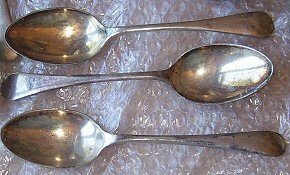 I want to say thank you for the quick return of my late Mum's childhood dessert spoons. They look so lovely and caused lots of tears. I am so pleased I found your company online & will certainly be recommending you..
Just received our cutlery. The silver re-plating has made a remarkable improvement. We can also offer you a polishing and/or sharpening service for stainless steel / sterling silver cutlery. Let us know which items you have and what you need doing, and we will get back to you with prices. Silver plated items (EPNS) are not suitable for polishing as this will cause the existing layer of silver plate to be worn down, or even removed. HOW LONG WILL THE REPLATING TAKE? Turn-around time will be estimated when we send you a quotation. Some items are ready in 2-4 weeks but some might take a good deal longer (up to 10 weeks estimated) depending on the number of items being re-plated and the work schedule of the factory. Some very large items might need to be outsourced and these could take longer still. We will give better estimates with our quotation offer. We will undertake one-off pieces or batches of many items. We are happy to receive enquiries from national and international customers. 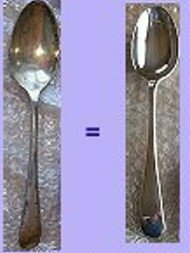 You can be certain that your silverware will be correctly treated, restored and returned to you in an enhanced condition. The factory handle these pieces with precision and care to achieve the highest quality to exceed expectations. Whilst restoration to the precise original condition might not always be possible, depending on the current condition of the piece(s), significant improvements are assured. See the feedback from customers elsewhere on this page. WHICH MATERIALS CAN BE REPLATED WITH NEW SILVER? 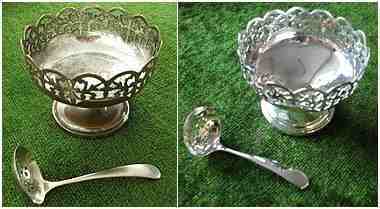 EPNS is the commonest form of silver plate, particularly for cutlery and this can be readily re-plated. Sterling Silver *, Copper or Nickel Silver are all capable of being re-plated. (For other base metals - please see below or ask). Britannia Metal - This may be marked as EPBM (Electro-Plated Britannia Metal). We now have someone able to replate Britannia Metal but please let us know if you have EPBM. Jewellery & Necklaces can be trickier due to the size of the items so good photos and dimensions will aid assessment. Stainless Steel EPSS may need an extra step to the process so please state if your pieces are stainless steel. If the metal has never been plated, polishing is possibly the first option to consider. Anything with a wooden/glass base needs careful assessment. Only metal parts can be replated so the factory would need to be able to check if they can work around the non-metal sections. Good photos will help. Tea Pots/Coffee Pots with plastic handles. Please identify any non-metal inserts/insulators so that the factory can appreciate what work-around is required. Crystal pieces. The metal sections will need to be detached or to be capable of being isolated. Good photos and descriptions please. Any item that contains china, enamel, wicker, wooden handles or porcelain will be done only at the customer's risk. Candlesticks with resin inside the base - these can probably be accommodated but please check the underside of the base to see what is in there and let us know. You may need to lift a baize covered panel to check. Photo Frames these can be delicate items so please comment on the sturdiness of the frame and whether there are any non-metal sections. Razors as these are usaully made of Aluminium. If you are not sure whether your item is suitable, please ask via the form below and send us a photo or two so that the factory can assess. Alternatively, you can send the item(s) in for assessment. Should it prove to be unsuitable for replating we will only charge you for return postage. WILL MY EXISTING ENGRAVING BE RETAINED? With regard to engraving, there are two types of engraving: Laser Cut or Hand-Cut. Whether it will be retained depends on the depth. Hand-Cut is rather deeper than if done by laser and will invariably survive re-silverplating. Laser cut is much shallower and may be obscured. Do please appreciate that re-plating will not make up for damage sustained over the years e.g. pitted, corroded, chipped or deeply scratched items. Whilst your silverware can be given a much brighter and smoother appearance it may not be possible to overcome significant damage. We don't assert that items can be restored to "as new" condition, but real improvements in appearance will be evident. If you have items that are maybe too far gone, it may be better to consider replacing with new, rather than re-plating. Be assured that if you do choose to have your pieces re-plated that the factory will do the best job that they can. Only very limited repair services are usually accepted by the factory e.g. straightening the tines on a bent fork. Other jobs requiring more major forms of repair will need to be individually assessed by the factory. Good descriptions of what is required together with photos of the work needed should be supplied. See Repairs page for details. The factory will do their best to preserve any existing engraving. Unfortunately, on occasions, damage can occur during the renovation process and this is unavoidable. This may be due to hidden aspects e.g. the tang of a knife blade may be corroded within the handle and may break off. It would be impossible to see inside the handle prior to working on a knife. Some other problems can occur and they might not be foreseeable until work has begun or has been completed. Please note that you will be required to accept the possibility that some items may break or become otherwise damaged/marked notwithstanding the best efforts of the workforce at the factory. If you do not wish to take the risk, then please consider replacing rather than re-plating/re-polishing. N.B. - Silver plated knives (and sterling silver knives) are usually made with a stainless steel blade. Silver plate is not a durable enough material to be used on a knife blade. It would quickly wear away during use so knives are made with a mix of silver on the handle, and steel on the blade. Therefore, when you seek a re-plating of knives, note that it is the handles only that will be re-plated. It is likely that the factory will give the blades a polish to brighten them up though so some improvement in the blades should be evident. The factory reserves the right to decline re-plating work after inspection of pieces where damage is too great or there are serious risks of further damage during renovation work. Some items (usually non-cutlery pieces) often have intricate design patterns on them and this makes for more complicated tasks for the re-platers. If you have a bowl or dish for example that has a complicated pattern on it, a good photograph or two would really assist the factory to assess the size of the task and to quote for the re-silverplating. These will be quoted on receipt of a detailed specification from you as to what items you need to be replated and the numbers required. It helps if you can give us an estimated value for insurance purposes when we return the finished item(s) to you. Basic postal insurance is for a low value unless enhanced cover is taken out. Please state the value on the enquiry form below so that your return goods can be covered at higher levels than are provided by basic mail services. When sending the piece(s) to us, please include: Your Name, Address, Postcode, Phone number, Email address and Insured Value. Because it is often difficult to locate good matches for your existing stock, and because of the high cost of buying a large number of brand new sets for your hotel or restaurant, you may well find it much more cost-effective to have your existing pieces renovated and re-plated. Special rates may be possible for bulk numbers so please ask. The silverware in a restaurant is not far behind the food as a guide to the quality of the establishment. Don't let your table cutlery let down your restaurant. 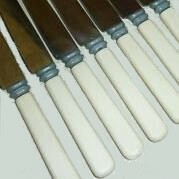 We can replace old bone handled knives with new dishwasher-safe synthetic replacement handles. Please fill in the form for details and pricing. NOTICE: Synthetic handles may be lighter in weight than the original handles which are being replaced and this may affect how the knives lay on the table e.g. the blades may now be heavier than the handle resulting in the blade end touching the table when set. We can now offer restoration of old and vintage cutlery cabinets. Old cabinets can be redesigned to fit new cutlery. Standard interior colours are available in black or blue. Would you like to keep your newly-replated items in pristine condition? We can supply you with Cloth Rolls to store your cutlery pieces. These can hold 12 items in each roll and are available in dark blue or gray and can be supplied in Standard and Teaspoon sizes. For more details and ordering, see here - Standard Cloth Rolls / Teaspoons Sized Rolls. RE-PLATING - DO WE NEED IMAGES? Please complete the form below or contact us and we will be happy to provide a quote. If you are asking about items other than standard cutlery pieces, the factory will need to assess the cost for quotation purposes so please can you be ready to supply digital photos to assist them. After you have sent the enquiry form below, you will be taken to a page with an Image-Upload interface where the photos can be supplied. Alternatively, you can send us the photos by way of e-mail attachment (to Sales@SteelCityCutlery.com). Items Where Images Will Need To Be Supplied..
How many items require re-Plating? How many items require Polishing and Replating? How many items require Polishing only (no Replating)? Guide: 10 microns is usually adequate for items that do not get heavy usage. Cutlery may warrant 10, 20 or 30 microns. Pewter / Chrome / Zinc / Aluminium / Britannia Metal items are unsuitable. The cutlery arrived today and is beautiful but now I have a problem - my wife doesn�t let me use it, she says its too good! Just to thank you very much indeed for the excellent re-plating. My wife and I are extremely pleased! Just unbelievable.... just cannot tell you how satisfied and happy I am for the amazing results of the re- plating of the soup ladle. Thank you very much for replating the cutlery & returning it to us. We are very pleased with it. I have just received the tray and I am delighted with the way it has turned out. Thank you very much. I should have replied to you much earlier to say how delighted I am with the cutlery. The result is even better than I expected! Just wanted to let you know that my silverware arrived today (Xmas eve) just in time for Xmas day dinner! Perfect timing. I am also really impressed with the restoration that you have done to these very old silver plated forks. I will certainly be using you for further work. I'm just confirming the dish arrived safely with me yesterday. I had to say a big thank you to you and your team. I am delighted with the results, a first class result and very efficient service. We received my replated half pint jug from you today and I just want to say how delighted we are with the results! It looks lovely, thank you so much! I shall not hesitate to contact you again if I ever have anything else that needs a new lease of life. Cutlery received, thank you very much. We are very pleased with it & may send a few more items of cutlery in the New Year. We received the re-plated cutlery yesterday. They look fantastic!! We will definitely recommend your firm to our friends and family. Thank you for processing this order in a speedy manner. Just a very quick note to say how very pleased I am with the work you did on the three spoons I sent you. I think I will be going ahead with the purchase of the six table and six dessert knives. Cutlery arrived back with me today, and is looking great. Thanks for the excellent service. I just wanted to say my cutlery arrived yesterday. It was worth the wait! - My grandmother's serving spoons have really come up well. Thank you very much for keeping me updated with progress etc. 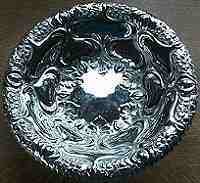 Just to say the silver plated bowls are back now. Thanks - They are shiny! The returned spoons look great - I can't imagine they looked that good when new. It's good to have given them a new lease of life. Just received back my replated 6 dinner forks and I have to say I am delighted with the results. The engraving on the handles is still very clear and the quality of replating is excellent. I shall be sending more of this family set for replating in the future. Many thanks for your excellent service. The (AEH) Trophy for cycling. This cup arrived back with me this week and the results of the re-plating are splendid. We are going to start using this trophy during the coming racing season and whoever wins it will have an admirable addition to their cabinet for the next year. Many thanks for the work you carried out. Thank you so much for re-plating my items of silver, they look AMAZING! My mum and dad (whoI inherited them from) would have been absolutely delighted with them. Thank you also very much for delivering them personally, very much appreciated. All I can say is that your colleagues have excelled themselves in restoring an item where 99.9% of the original plating was gone. I wondered if it could be restored. The item was found in a distillery in Glasgow that was being demolished, huddled in a pile of junk that was destined to be crushed under the bulldozer. I asked if I could have it, was told to take it away, wondered if it was worth the effort, decided to go for it - and you know the result. Thank you again for a first rate job. Thanks for returning my soup ladle and for your time and excellent customer services. Thanks very much for the very fast return of my replated cutlery today. I was surprised and delighted to receive them back so quickly, and the replating makes them look just like new. I will definitely use your company again when they need replating again in 20 years time! Best regards B.D. Received with thanks very well done. Thank you for the work you did on the bell... It looks fantastic. I received my re-plated cutlery items in the post today and was astonished at just how stunning they look. Thank you so much for a superb job. You've just completed re-plating cutlery items for me and it's a brilliant job!! Thank you... and that's why I'm sending more! I received my replated tray back from you today. I can't tell you how delighted I was with the result. It is far better than I could possibly have hoped for, with all the scratches gone yet the engraving still crystal clear. So lovely to have something given to my grandparents on the occasion of their marriage looking so good. The forks have just arrived (28th). They look marvellous. Thank you so much. I received the re-silvered candelabra a day or two ago and it is beautiful! I shouldn't have been surprised of course, but it was just perfect - like new. So pleased. I just received the cutlery from you. My first words were "Absolutely Brilliant!". The two spoons arrived today. The result is far better than my wife and I expected, in fact we couldn't believe they were the same spoons! Very many thanks for a grand job. My fork arrived yesterday. It's beautiful! Thank you so much for the care & workmanship you gave to my mother's silver. Each piece is quite lovely. Needless to say, the next two generations of my family who get to use it after me will cherish it as the last two generations have. 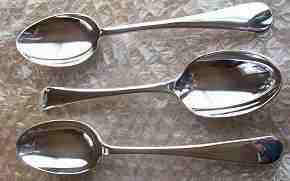 My wife and I would like to thank you for the quick return of the two spoons we sent for silver-plating last week. We are delighted with the results, and the spoons are transformed. Thank you also for straightening them. At one time, many years ago, I used them as tyre levers when repairing cycle punctures! Re-plated spoon - I'm delighted with it. Your company did a beautiful job. Must say - well impressed with the " new " tankard. First plating was 1949 so will contact you in 2075 to see if your work is up to the original standard !!! Just to let you know I have received my spoons and I am absolutely thrilled with the job. The quality of what you have done is excellent. The spoons belonged to my mother's mother who is no longer with us but my mother can hardly believe they are the same spoons, and it means so much to her. "The re-silvered meat plate cover arrived on Mon. The result is excellent, thank you. My 90 year old aunt is very pleased!" "The mug arrived this morning much to our delight. It is absolutely splendid for such a reasonable price and I would like to thank you and your team for beating the deadline by a large margin. "Replated cutlery arrived safely. It looks fantastic, are you sure that they are not new replacements? Anyway, many thanks." "We are thrilled with the 3 tablespoons you have replated for us. They are beautiful! I have one more tablespoon requiring replating..."
"I think we might send the rest of our silver back to the guys in the factory for polishing. What a difference in the shine." "I now have it and its BEAUTIFUL. Thank you." "I received the cutlery I sent you for resilvering back. I am highly delighted. Thank you so much for a great job. I am so pleased that I would like to send you a further 23 pieces..."
"Cutlery received and look very good, better than new. Thanks." First batch of cutlery received yesterday. Thank you very much, it looks very lovely. Thank you for my replated water jug; I'm amazed at how good it looks, far exceeding my expectations! Replated salver arrived safely in good condition thank you. Good to have it back looking fine. Many thanks, the cutlery arrived bang on time to catch us on our way through the UK. I must say that you have done a marvellous job. Although their plating is not as worn, we may have to have all the forks done on our next trip, just to match the glossiness! "Knives received and we are very impressed. Many thanks for your help and service"
Many thanks for the tray & spoon now received. Excellent job - well worthwhile. A note to let you know that the small ladle arrived safely here today. It is perfect. many thanks. Received cutlery today, many thank after a quick look at them I am very pleased so will keep your name in case I need you again. Spoon received; Brilliant. Many thanks. Just a quick email to let you know that my forks arrived back safely and that I am very impressed with the level of finish. They look fantastic! Thanks. We received the forks today and just wanted to let you know that we are absolutely delighted with the results. "Just to let you know I have received my spoons and I am absolutely thrilled with the job. The quality of what you have done is excellent. 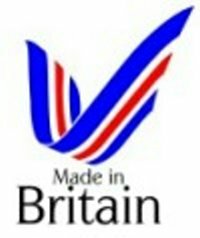 "Just received my sparkling cutlery - it looks fantastic (it won't be going in the dishwasher), thank you so much. I'll be in touch after Christmas for the next batch. Again, many thanks, I'm so delighted." Well what a lovely surprise it was to receive back yesterday our re-plated tray in all its glory. It was particularly fortunate that it arrived then because we held a small party at lunchtime & it was much admired as it was used to carry round finger food beforehand. It really looks wonderful & I am very grateful to everyone concerned in its transformation. Please pass on our thanks. All received safely earlier in the week. All looks good - Many thanks. Received my knives back from you today and am thrilled with the result, they look wonderful. Many, many thanks. They have been transformed and given a new lease of life! Just a line to say that the spoons arrived back (in fact the other day, so apologies for the delay). I'm absolutely delighted with them. Thank you so much. It's lovely to have something that has been in the family for at least three generations restored to life again. Everyone is admiring them. I hope to send you on the details of some fiddle forks you might do for me, perhaps this side of Christmas, if possible. In the meantime, many thanks again. Giddit! Thanks for your terrific service. The transformations exceeded even my high expectation. Tray received. Job well done. Thanks. I received my spoon today. It looks beautiful once again. Thank you so much, I am so grateful to you. Thank you so very much for the work done on my beloved, old family spoons. They look amazing!!! I have just had the odd journey of clearing our family home of 50 years and these spoon were very much part my growing up. I remember my dad bringing the Apostle Spoons home already a little worse for wear, but we liked them and the little sugar "shovel" we used for many years and almost wore it out. I wasn't sure if I should keep them but they had fond memories attached. The re-plating you did has made them look a million dollars, I so thrilled. Love looking at them. They are my treasures now. I doubt they ever looked so good! Very best wishes to you all, you have a very happy customer. Many thanks for the return of salver. I think the Club will be delighted with it, it must be years since it looked that good. Thanks for a splendid job. The cutlery arrived back safely, and we are very pleased with the result of the re-plating. We received the silver plated spoons last week and I apologise for not thanking you sooner for your firm's wonderful work. The spoons look like new and my wife is under instructions to use them sparingly! Thank you so.much for the spoon. It looks amazing. Great job. The cutlery items have arrived - Many thanks for a wonderful job! I received the decanter a few days ago. Excellent work, Many thanks. Just received my sweet dishes and fish set this morning. They are lovely. Thank you very much. I just wanted to say thank you for the replated punch bowl - I think you did a really good job. Items arrived just now , and we are absolutely thrilled , well done and thank you. They belonged to my grandpa who had same initial C. I'm now 70. I doubt you've seen such neglected tut! Now turned to treasure. next batch is on its way. Yours etc. Happy client, C.
Just to let you know that the trays have just arrived back. There are looking fabulous, I'm very pleased with them. As soon as Easter is over I'll get some serving spoons off to you for re-plating. Hi Robert, I received my cup this morning. Thank you very much, great job done, looking like new. Very pleased with replating, thanks for all your service and more than happy to recommend your company to my Golf Club for any future business. Thank you. I have received the cutlery. It is brilliant. The refurbished cutlery has landed! Thank you. You have given my aged cutlery renewed life. The cutlery was a gift from my parents some 50 years ago and the re-plating is so much better than having it fall into disuse. From my first enquiry you have been very quick and efficient - a pleasure to do business with you. Just a line to let you know that we have received our re-plated forks from you this morning and we are delighted with them. Thank you so much for all your help and attention. Got the spoons - brilliant job. Now I have found you I am sure there will be more small items. Thank you for the safe delivery of our toast rack. We are absolutely delighted with the results! I shall be sending some other items in due course. Just received back my scissors - They are beautiful, thank you SO much. Such a wonderful transformation. The tankard has just arrived - It looks great. My customer will be delighted. An heirloom restored for the next generation about to be born. Just to say thank you so much for the cheese domes. They look amazing. Today I received back the silver fruit stand I sent to you a few weeks ago. I just wanted to say how pleased I am at the result, it looks excellent and we are all happy to have a much loved piece back in the family looking like new! What a super job. I am most impressed with the results you have been able to achieve from this item in such terrible condition (originally). Add an up-turned soup plate in the bowl, a Christmas cactus placed thereon and the result is quite spectacular. Our re-silvered candlesticks arrived here safely this morning. We are delighted with the result so please accept our thanks for an excellent job. Cutlery has just arrived - WOW!!! What a huge difference, I am really delighted. Thank you very much for this excellent work. Many thanks. The 6 tablespoons arrived in the post today. We are absolutely delighted with the result. Good to know there are still true craftsmen around! Again with our thanks. We had the cutlery back yesterday and we are delighted with the results, it all looks fantastic and it has given it a new lease of life. Many thanks for the excellent job - The spoon looks stunning now! My apologies for not acknowledging the receipt of my cutlery. It has arrived and is now perfect. Thanks you for your help with this. Thank you for the transformation you have effected on the forks, which now look too good to use, and the handles of the knives which makes them look as good as new. This is going to make food a much more enticing prospect! Spoons arrived - great! Many thanks for your excellent service. We received our cutlery back yesterday. The cutlery never looked so good - when I bought it in 1993 it had already lost all his shine. Your company did a WONDERFUL job - we are over the moon! I was delighted to receive these items, which have turned out very well. I would like to send you another 8 similar items, please. Could you send an estimate of the cost please so that I can include a cheque? Hi Again, They arrived safely, Thank you so much. Fantastic job. All the items received safely and once again we are delighted with the transformation! I received the pieces yesterday. They look beautiful! I never expected the ladle to look as good as it does. The spoon as well although not quite in as bad a condition as the ladle. Received tray on Saturday very pleased with the result. Spoon received safely back, a lovely job. Very many thanks! I have just received the replated spoons and just wanted to say how thrilled I am with them. I have not seen them looking like this for 70 years! Thank you so much for your excellent service and workmanship. I shall recommend you to everyone and am looking round the house to see what else can be transformed. I have just received the previous items from Anne in Sheffield - they are lovely and I cannot thank you enough for such a beautiful result. When I go through my stored stuff I am sure there will be many items needing doing. 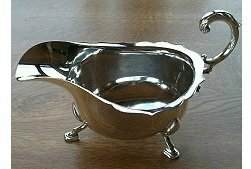 Also from same customer: Just as your email came in, the postman knocked - thank you so much - the little ladle is also beautiful now! Received box today, it looks fantastic. Shall buy again. This morning I received my basket and cutlery which you kindly replated for me. I was so thrilled when I unpacked the very well packed box. It is absolutely beautiful! Thank you so much. Using them will give me so much pleasure. They originally belonged to my mother and we found them when cleaning my parents' house. She used the basket to serve mince pies each Christmas and now I shall be able to do the same. Arrived - nice job thank you. I have more for you to do and will be in touch in the week. I would just like to thank you for my re-plated spoons. I am so pleased it has put the rest of my cutlery to shame. I will be in contact soon. Just to let you know that the rose bowl arrived safely today. I an delighted with how it looks. Thank you very much. The buckle arrived back on Saturday. What a transformation! My candlestick has now arrived back safe and sound and it looks great! Cutlery received back today - excellent, looks brand new will send the remaining items at the weekend plus one small item for silver plating. Just to say thank you so much for my rejuvenated frog (ornament) - What an improvement! He is safely back on the hearth, just in time to add to the Christmas sparkle. I do hope you are aware how much pleasure your work like this adds to the world. Thank you for the safe return of my cutlery. The package arrived safely this morning and I am absolutely delighted with what you have done with what were such horrid old silver plate items. Thank you SO much! I shall probably be back to you in the New Year with some more! I just wanted to confirm safe receipt. We are absolutely thrilled with the job you have done. Thank you. Received cutlery yesterday, very pleased, cant believe the difference! I have just received back six pastry forks which you have re-plated. I am absolutely delighted with the results. Thank you so much. Excellent job. The cutlery had arrived today. I have opened a couple of the packets, I am very pleased with the look. I got my soup spoon this week. I am soooo happy!! It came out absolutely wonderful!!!!! Thank you so much!! Very pleased with re-plated flask. ... many thanks indeed for returning the pieces I had sent to you for plating - admittedly a bit tongue in cheek. Then end result is superb. You will hear this continually, but they are as new. This is excellent work, for which all credit is due to your goodselves. Yes, they turned up yesterday and look fabulous, so many thanks. My Great Aunt, Nan and my mum would be very pleased to see they've been preserved for another generation, the sentimental value is beyond price and there practical use has been restored, they'll be on the table once again. Will send you details of a commemorative tray for an estimate along with another spoon. A quick note of thanks for the fantastic resilvering of my old soup ladle. It's used almost daily and I think of your company every time I use it and how you have given the ladle a new lease of life. It looks as good as new. I received my fish servers today. Thank you for your prompt and courteous service. The cufflink has arrived and I just wanted to say thank you for taking the time and effort to deal with such a small item so efficiently. My son will be very pleased. Parcel of silver safely received today - very prompt service! As before, a very nice job - including the preservation of "historic" dents in one spoon. We can't, I'm afraid, offer you any further business ourselves, but I will certainly recommend you to friends. We have been very pleased with all aspects of your service. I'm sorry ... I meant to email you to thank you for returning the cutlery. We're very happy with the way it turned out, bearing in mind the original condition. The 6 forks arrived safely today - just in time for Christmas, which is brilliant. Workmanship looks excellent - a very smooth clear finish, and the old engraving showing through very nicely. Very many thanks. 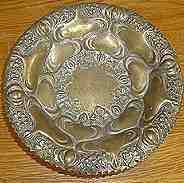 We may well be coming to you again in the future with more of the family collection of worn-out silver plate! Order received, thank you - They look better than brand new, excellent! Just to confirm the cutlery came back a week or so ago and we're very happy with it - and the speedy turnaround. This is just to let you know that the Rose Bowl you received from us for re-plating arrived back today and we are very pleased with the result. 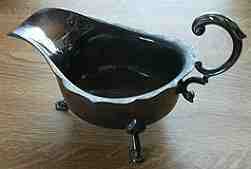 We know that our daughter will be delighted to have this bowl which belonged to her Great Grandmother. I received the replated ladle in the post today, well ahead of the anticipated delivery date, thank you. I am delighted with the result - like new! I shall be pleased to recommend your service to my friends and acquaintances. I have received the re plated forks - and they are LOVELY. I am so thrilled with them - thank you so much. Please pass on my thanks to the staff and to you. My cutlery has just been delivered and looks amazing - thank you! Thank you also for such a speedy turnaround, it's greatly appreciated. I have already passed on your website details to my sister and you should hopefully be getting an email from her about some re-plating. Just to let you know that I have just received the knives that you were repolishing for me and I am delighted with the result. Thank you very much and can you advise me how to keep the knives especially the blades looking as they now do and the best way to clean them. Many thanks JG, UK.